I don't know about you, but student transportation has always stressed me out! It's the most important piece of information I need for my students on that first day of school. I learned early on that I needed a system to save my sanity! So, I just wanted to drop in to share my system and how it has helped me. You may have a better system. If you do, I would LOVE to hear about it! The more ideas and ways to do it, the better! This is the note I will have parents fill out on Meet the Teacher night. I have a checklist that they will have to complete that night and part of it is filling out this form. 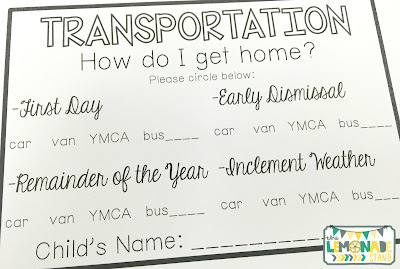 I tried to cover all the bases for the year in which transportation information from school is needed. These are the options at my school this year, but I have included an editable letter in my pack for you to customize to fit your schools' needs. 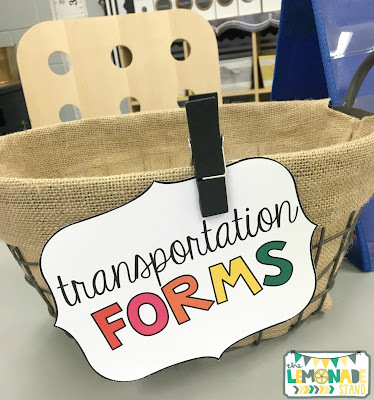 After they fill it out, they place the form in this basket on my teacher table. I want them all in one place! After I add the info to a spreadsheet, I file these in my student information binder for easy access throughout the year if needed. 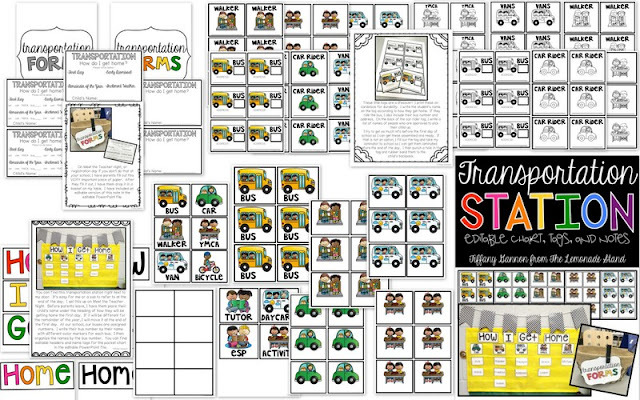 I have each student's name on a card ready for this pocket chart. 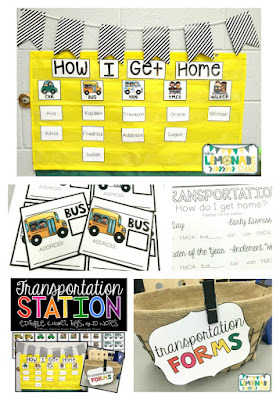 This is my Transportation Station right next to my classroom door. As soon as I know how students are getting home the first day, I move their name under the corresponding header in the pocket chart. Our buses are by number, so I will write their bus number as soon as I find that out under their name. 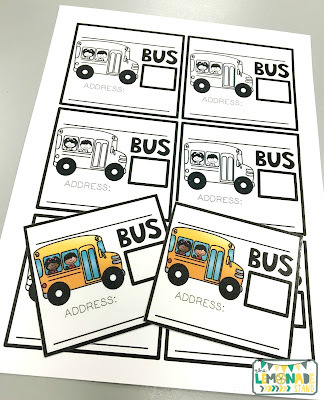 I will write each bus number in its own color and sort the names by buses. That way I know how many kids are getting on each bus. This pocket chart system is great. If I have a substitute teacher, they can easily refer to this chart at the end of the day. It's great for me, too, especially at the beginning of the year when things can be really crazy at the end of the day! And another lifesaver for me has been backpack tags! 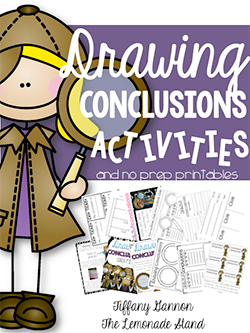 I print out several pages of each way students go home on card stock. After I fill one out for each student, I laminate them. There are always those students who you don't know how they get home until that first day, so I take my Scotch laminator to school with me. That way I can easily make their tags, too! Once I cut them out, I hole punch them and use a rubber band to tie them onto their backpacks. 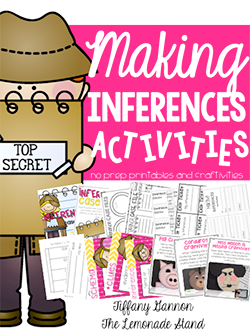 Everyone will thank you for adding these to your little ones' backpacks! 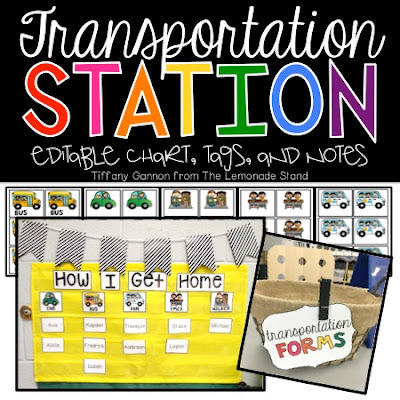 I would love to know how you organize your transportation! 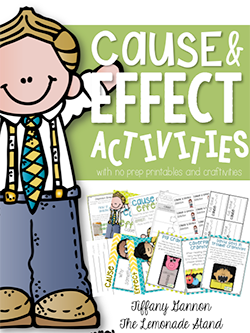 I am always looking for new, easier ways to do things, especially during the back to school season. 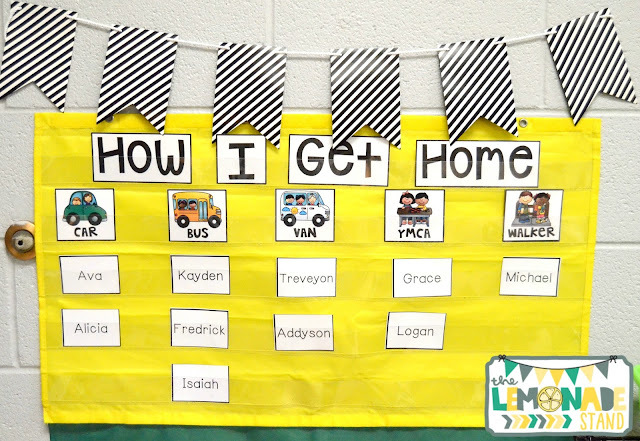 If you are looking for a way to organize your system of getting students home, you can see below everything I use to do just that. 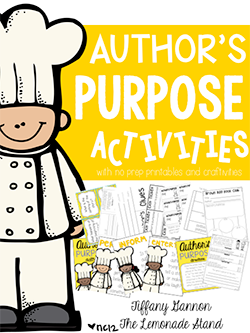 All of the notes, tags, and headers are completely EDITABLE so that you can customize them to fit your classroom needs! I hope this makes your back to school time a little bit easier! Have a great weekend and enjoy these last few days of summer! stablishments moved toward becoming TECHNOLOGY UNIVERSITY instruments for changeless isolation. Nice blog, your work is great and I hope for some more nice posts. Continue writing such a nice blog. father agnel school noida review It’s hard to discover fantastic composition like yours nowadays. And also here I got new ideas and guidelines. Thank you so much for your great sharing.